Does your band have what it takes to rock the Moon Amphitheater? Submit your press kit to moonparks.org/bands for a chance to compete in the first ever Moon Parks Battle of the Bands! 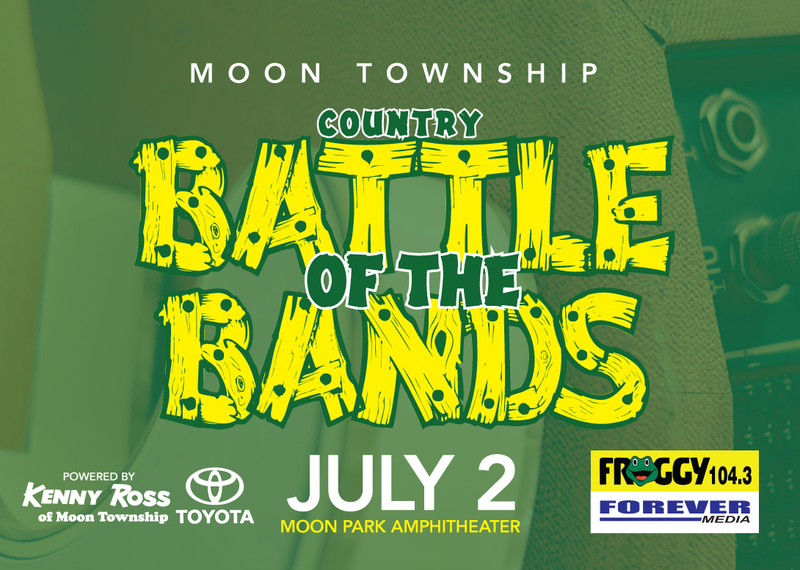 Bands will compete for a slot in the Moon Parks and Recreation 2018 Battle of the Bands. The winning band's song will be played on Froggy 104.3. Bands will be judged by our esteemed panel of judges comprised of local Pittsburgh music legends. The crowd will also make up a large component of judging for this event so bring your A game, and entertain the masses! Deadline for submissions is June 12th. The lineup for the Battle of the Bands on July 2 will be set June 15. Performances on July 2 will be limited to 25 minutes. If you have any questions or concerns regarding this event please direct them to bbrozovich@moontwp.us. Good luck, and Rock On! The BotB contest is open to any area unsigned band playing any genre of country music. Bands will be asked to provide a stage plot in advance and use the professional gear (backline) provided, .e.g. mics, drum kit, amplifiers, monitors, keyboards. Musicians will be expected to use their own guitars. Bands will be judged based on the criteria listed below. Contest rules and prizes can be added, deleted and/or modified at the sole discretion of the Moon Parks & Recreation Department without further notification. SIDE STAGE: During set changes, a second stage will be available for Moon Township residents who want to sing or play an instrument - tracks (Karaoke) will be permitted. The side stage is NOT part of the BotB competition. To register for the side stage, use this form and write “SIDE STAGE” across the top. CONTEST ENTRY: There is no entry fee. Please scan and return this completed form - along with a link to audio OR video of your band - to bbrozovich@moontwp.us. If your submission is accepted, you will be notified by Moon Parks before June 15, 2018. The winning list will be published on www.moonparks.org. The event will be videotaped by and aired on Moon Community Access Television. Along with a trophy, one song from the winning band, if sonically and content appropriate, will be broadcast on FROGGY Radio 104.3. All music should be family and radio friendly. Each band’s competitive performance will be limited to a maximum of 25 minutes.